In 9th grade, students will learn the rules of correct English grammar. They will start the year by reviewing parts of speech, parts of a sentence, the phrase, and the clause. They will focus on word usage: origins of English, agreement, correct use of pronouns, correct form and use of verbs, correct use of modifiers, and common usage problems. Next, they will study writing mechanics: capitalization, punctuation, and spelling. And finally, they will learn about the composition and the writing process: structure of the paragraph, the composition, expository essays, persuasive compositions, creative and expressive stories, research papers, business correspondence, and effective diction. By receiving daily grammar instruction and exercises, the students will become competent in English grammar. They will also learn the rules of writing mechanics by doing exercises and by applying them to the articles, essays, critiques, and research papers. They will also put their learning into practice by writing journalism articles of various types: news, editorial, and feature. The students do interviews, take notes, write an outline, and edit their articles at least 3-5 times until they are polished. While doing newspaper layout, the students learn how to correct and improve images with PhotoShop and ImageReady, and they learn page layout with PageMaker and Quark. Students will also continue to develop their vocabulary skills, learn new words, and review previous ones. They will be encouraged to use new words in their speech and writing. In order to prepare for their upcoming SAT/ACT Reading and Writing portions of the exams, the students will take one section (30 minutes) each week as homework. This full-year course is a continuation of the 9th grade grammar class, and is designed to provide students with a solid grammatical foundation, and to improve grammar skills, vocabulary range, and writing ability. Students will study a variety of grammar textbooks and writing manuals, read novels, do grammar and vocabulary exercises and take practice SAT/ACT Reading and Writing tests. They will also apply their knowledge of English grammar and syntax to a variety of writing projects, including journalism articles, chapter analyses of literary works, and an essay. By the end of the year, students should have an even stronger command of correct written and spoken English; they should also have significantly increased their vocabularies and improved their writing styles. They should also be able to edit and revise their own written work, and to craft strong journalism articles, chapter analyses, and essays. This course is designed to build up and enhance students' grammar and syntax skills, vocabularies, and writing and editing abilities. Students examine a variety of writing styles and focus on writing clear and concise sentences, paragraphs, and essays. They will continue to read short stories and contemporary novels, do writing exercises, and improve critical thinking and vocabulary skills. They will also put their skills to practical use by writing journalism articles, poetry, reaction papers, impromptu writing exercises, and their college application essays. By the end of the year, students should have a strong command of written and spoken English; they should also have a comprehensive vocabulary and improved their writing styles. They should also be able to edit and revise their own written work, and to write strong journalism articles, book analyses, and essays. Perhaps most importantly, they should also have become lucid and thoughtful communicators who have developed not only strong grammatical skills and good vocabularies, but also a set of good analytical, critical, organizational, writing, and revising skills. English in 12th grade at Merit Academy is designed to prepare the students for college writing. This class assumes student mastery of grammar, writing mechanics, and research writing skills from previous courses. Under the guidance of their teacher, the students will learn how to manipulate the English language for a diverse selection of audiences. In order to prepare them for the wide range of writing demands that come with university and the job/internship market, the students will learn how to write investigative and personal journals, analytical reports, and candid articles during the fall trimester. The students will learn how to write scientific journals, treatise, and research papers. The students will receive an introduction to statistics, with a focus on hypothesis testing, to prepare them to better understand statistical figures used in technical and scientific journals. The students will read creative, insightful, and technical articles written by and for scientists from various publications to gain a solid insight into the world of science writing. This first course of a three-trimester series focuses on early United States history. It includes coverage of Native American tribes, Native American interaction with European exploration and settlement, colonial times, revolution, and the United States under the Articles of Confederation. This course centers on those experiences which formulated the American character such as the Constitution, westward expansion, manifest destiny, slavery, the Civil War, immigration, invention, and industry. The students will examine the events that led to the founding of the nation and the ideal philosophy of the government described in the Declaration of Independence. They will also discuss the presidents, currency, political parties, timelines, etc. They'll analyze the effects of the Industrial Revolution, migration to the city, and immigration from Europe. They'll also look at how religion has affected the birth of our nation and continues to have moral, social, and political impact on society today. And finally, the students will trace the United States' rise to its role as a world power in the 20th century. Studies of groups, individuals, philosophy and social impacts will have equal coverage with political, economic, and military developments. Primary source material, historical works, biographies, and literature will provide further in-depth studies and clarification of events. The second course examines the major political, social, economic, technological, and cultural developments of the 1920s. The students will analyze the different causes for the Great Depression and how the New Deal fundamentally changed the role of the federal government. They will also analyze America's participation in World War II and the post-WWII economic boom and social transformation of the United States. This course follows the United States from the Theodore Roosevelt era through the world wars, conflicts, social and economic upheavals, and the struggle of world leadership. Philosophy, biography, and literature will be studied to gain insight into the development and progression of each theme. The students critically evaluate the events and issues of this era. Note-taking techniques and skills are refined and organizational skills are emphasized. The third course examines the major political, social, economic, technological, and cultural developments of the 1920s. The students will analyze US foreign policy since WWII and will discuss federal civil rights and voting rights. They'll end the trimester by analyzing major social problems and domestic policy issues in contemporary American society. Internal American history, as well as external situations, will create a spectrum of topics for critical evaluation of our history: how art and music reflects changes in lifestyles and social structures in American society; how urban and suburban movements, transportation, fast food, air conditioning and the computer revolution create havoc with the traditional family and community units; how immigration quotas are only a small part of America's struggle with its 'melting pot' image. Interviews with people who have been first-hand witnesses to various historical events will provide different, more individual perspectives and insights into the events being studied. Merit Academy's comprehensive year-long World History course traces the major historical, cultural, and economic events from pre-1500 to the present day. It assumes the students have an extensive background in Ancient, Medieval, Renaissance, Era of Revolutions, and U.S. History. Equal emphasis will be placed on the study of groups, individuals, and philosophies, and the students will examine political, military, and economic developments throughout history. All 10th grade courses at Merit Academy revolve around the unifying theme of world history and culture; much of the coursework in this class will intersect with and complement that of English and literature courses. This class consists of lectures, assigned reading, in-class discussions, timeline and map creation, art projects, class presentations, field trips, tests and quizzes, and three major research papers. Merit Academy's high school World History course is a review of a comprehensive six-year study of world history that spans from 4th to 9th grades. Prior to this course, they will have studied ancient civilizations (one-year study); medieval civilizations (one-year study); the Renaissance: Reformation, Science Revolution, Explorations, Art and Culture, Religions (two-year study); Age of Revolutions (one-year study); and United States history (one-year study). Given this background, this course will launch straight into the modern era after a brief review. The students will analyze the causes, the course, and the effects of WWI. They will cover domestic discontent and how nationalism mobilized the civilians to support the war; principal theaters of battle and geographical factors; the negotiating roles of world leaders and their influence on such treaties and policies as the Treaty of Versailles and Woodrow Wilson's 14 Points; and how the war influenced literature, art, and music. The students will also examine Lenin's totalitarian control and the Russian Revolution and how Stalin's use of economics, politics, controlled press, and violations of human rights led to his rise to power in the Soviet Union. Finally, the students will compare and contrast the Fascist and Communist totalitarian regimes that followed WWI. This second course in Merit Academy's year-long world history class will explore the impact of world politics, philosophy, warfare, music, and industrial changes on society between the end of WWI and WWII. Lectures will provide both specific and theme-related historical information, while literary and historical selections for World Literature will provide further in-depth study. Students will also study music and art from the era. The third course examines the 20th Century shift of power, which brings economic and military problems and signals change in the power structure of the world. In a final internal fight for the control of Europe, World War II exhausts both the losers and winners and involves the world community. A new Europe emerges as old enemies try to coexist and work amid outside threats. Nuclear arms, the Cold War, and loss of colonial possessions are significant issues. The students at Merit focus on Non-European and American world history by studying the cultural, military, economic, and international situations of the Middle East, Africa, Mexico, Latin America, and South East Asia. By studying world history from a global and chronological perspective, the students will have a better understanding of the major issues that will unfold during the 21st Century: Health care, terrorism, weapons of mass destruction, energy, over population, global warming, and warfare. Further appreciation of the changing world will be gained from the study of art, literature, and music. Students will study maps and make timelines, listen to lectures, and participate in discussions. Merit Academy's two-part Economics program begins with a study of microeconomics. This course examines how markets allocate resources in different kinds of economies. Topics include competitive markets, monopoly, financial markets, income distribution, market failures, the environment, and the role of government. The students will look at the use and misuse of graphs to analyze economic trends. They'll also discuss scarcity and choice; supply and demand; choice and demand; and demand and elasticity. The students will examine supply analysis of the economic short run versus the economic long run. Next they will look at marginal analysis: output, price, and profit. And finally, the students will discuss markets: competitions and monopolies; price systems and market mechanisms; real firms and financing; the factors of production; market regulation; taxation and resource allocation; externalities and natural resources; international and competitive advantages, and other such topics. The section on markets will also include discussions of income distribution, labor, poverty, inequality and discrimination. Students will also watch and discuss the economies represented in films. They'll also play a variety of games that stress strategy, networking, and concepts in economics. The macroeconomics course examines how markets allocate resources in different kinds of economies. Topics include aggregate outcome of individual actions and examine topics such as: income and spending, the demand-side equilibrium, changes on the demand side, supply side equilibrium, and managing aggregate demand. Students also discuss money and the banking system; monetary policy and the national economy; debate over monetary policy; deficits, monetary policy, and growth; and the Phillipp Curve and Economic Growth. Each student writes a 5- to 15-page analytical essay for each course. Global Issues prepares the students to become active stewards to promote change in the world. It is assumed that students have a comprehensive background in United States and World history. This one-trimester course is designed to enlighten students about global issues that face the human race from an international perspective. The students explore current issues: human rights, civil rights, racism, sexism, violence, terrorism, war/peace, poverty, hunger, justice/rehabilitation, energy, education, environmental stewardship, international trade/business, health/disease, eldercare, United Nations, and religion. They are required to read a plethora of magazines and newspapers to evaluate how various media sources report the news. The students also give an oral presentation after the in-class reading to develop critical thinking and analytical skills. Debates and discussions will follow. By enlightening students about current international and national crises, the students will learn to defend their opinions on a wide variety of issues. One of the goal of this class is to teach the students to use concise oral language skills in describing opinions, events, solutions, and philosophies. The students write four essays (5-10 pages). After collecting current events, the students discuss issues that will impact the lives of people around the world and brainstorm about possible solutions to these problems. The students also watch movies for Merit's Movie Nights to see a fictional spin on a variety of the global crises. To chronicle their responses, each student keeps a journal to document their thoughts, fears, concerns, and hopes. In order to engage the students in these global issues, each student is required to participate in a program that addresses one of these issues. After volunteering for a minimum of 25 hours, the student provides a presentation to the class about the social concern, the program's organization, and suggestions for improving the program. 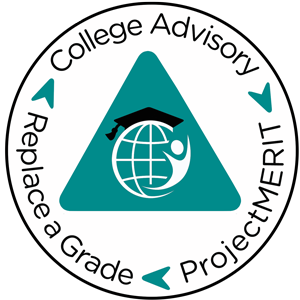 Merit's comprehensive Civics course will introduce the students to civics, politics, and government. They will examine the history and changing interpretations of seminal documents such as the Constitution and the Bill of Rights, and will learn about the structure and foundations of (as well as the relationships between) all levels and branches the United States government. To temper raw idealism with first-hand experience and real-life situations, students will attempt to initiate political change by proposing a local, state, or national initiative or joining a campaign. Students conduct a project, write a formal research paper, intern with a politician, read a variety of newspapers and magazines, read a contemporary book on current politics, and watch films that portray politics in action (historical and fictional). At the end of the trimester, the students tour the state capitol or Washington, DC. They will come away from this class with a thorough understanding of both the rights and the responsibilities of American citizens. Merit's Introduction to Psychology course will introduce the students to the study of human consciousness and behavior. Topics to be covered include neuroscience, learning, perception, cognition, memory, the psycho-pharmaceutical industry, human development, social interactions, and mental disorders. Students will read a selection of original influential writings by Freud, Jung, Skinner, Maslow, and Rogers. An attempt will be made to enmesh various psychological movements and schools of thought to relevant social, philosophical, and historical movements. Each student will volunteer to participate in psychological research studies at a local college. They'll write a term paper entitled 'Who am I really? '(12-15 pp), which considers the application of the psychological perspective to the student's daily life. The students will also write weekly response papers about in-class readings and lectures. The class will take two field trips: (1) to the Behavioral Health Unit at the local hospital, and (2) to a mental institution. Merit Academy offers this world religions course to give the students an overview of the five major religions in the world. Entering adulthood and preparing for college, the students will have a comprehensive foundation in understanding how these religions have expanded since the beginning of man. This one-trimester course will introduce the students to the following 5 major contemporary religions of the world: Christianity, Buddhism, Islam, Judaism, and Hinduism. During the last 2 weeks of class, the course will focus on cults and other dangerous organizations that prey on individuals who are susceptible to cult leaders. The students will discuss the types of people who become involved in cults and they'll learn about therapies to help individuals recover from the control of these cults. The students can either write a paper comparing the 5 religions, investigating cults, or researching current religious wars (10-15 pages). After reviewing the history of each, the students will then compare and contrast the religions, and they'll attend religious sermons to learn more about each religion. Merit's year-long American Literature course covers the time period from the 17th to the 20th centuries. The students read 36 unabridged works of American literature and a variety of speeches, essays, poems and short stories; they also watch 36 movies (12 per trimester). Students will not only learn about significant authors and literary works; they will also gain insights into important historical personages, events, and lifestyles. They will also use their study of American literature to improve their communication and analytical skills, producing papers and in-class presentations, as well as engaging in discussions and debates. Since all 9th grade courses at Merit Academy revolve around the unifying theme of US History, much of the coursework in this class will intersect with that for other classes. Merit's year-long World Literature course is an exploration of European literature from a variety of perspectives. Lectures and readings will familiarize students with the history and development of European literature. To provide students with a variety of intellectual stimulation and critical analysis opportunities, each trimester presents the material in a different manner and with different critical emphases. The first trimester is organized by literary genre, (American and English Drama); the second provides students with the opportunity both to analyze original works of European literature and to address issues of translation and adaptation for other media (Translation and Adaptation); and the third organizes material by theme (Utopias and Dystopias). This provides students with the opportunity to concentrate on different facets of literature and critical analysis throughout the year. The first trimester course will provide students with both exposure to European literature and a solid foundation for the interpretation and analysis of plays. Students will read a selection of plays ranging from an ancient Greek tragedy to modern American and European drama and watch a selection of dramas (both live and in film format). The students also read 12 unabridged novels/plays. They will write 1-2 page critiques of each play/novel and also produce a 3-5 page compare-and-contrast paper. In order to further their knowledge of and appreciation for this art form, students will also write a one-act play. Students will come away from this course with an understanding of the history and development of drama. They will have read a selection of important dramatic works, and will be able to discuss and critique these intelligently. They will also come away from this class with practical experience in the art of drama, having written and produced their own one-act play. Each student will write character sketches, a detailed outline, and several drafts under the guidance of the teacher. They will also create a set design model for the play. The students will create scenes complete with furniture, costumes, and props. The second trimester course has two main focuses: to familiarize students with canonical works of English literature, and to foster critical awareness of the issues involved in both reading literature in translation and adapting literary works to film. The impact of foreign language and literature on the English language will also be discussed. Lectures will provide history and context. The students will read unabridged novels and write 1-2 page critiques of each; they will also watch full-length movies of these works to compare the director's interpretation of the novels. Other required work includes: tests and quizzes, reaction papers and essays, and a short translation of a selected work. The translation will be done with the combined instruction and guidance from the foreign language teacher and class. The students will also participate in weekly in-class readings, memorize 5 classic quotations from European authors, and deliver 2 speeches or drama characterizations. The third trimester course during the 10th grade coincides with the study of World Wars in HIS 1030. As such, the works chosen for study and analysis for this course deal with war, its impact on society, the utopian ideals for which such battles are fought and the nightmarish dystopias that may result. Lectures and movie selections will focus on the development of European literature and readings from the 19th and 20th centuries. The students will read 12 unabridged novels each trimester and write 1-2 page critical analyses of each. Students will also watch films and take tests and quizzes. They will also participate in weekly in-class readings, memorize 5 classic quotations from European authors, and deliver 2 speeches or drama characterizations. Merit's Asian Literature course is a general introduction to the rich world of Asian literature, and is targeted towards advanced students who already have a firm grasp of literary and critical analysis. Students will receive a general introduction to the history and development of Asian literature, read 12 unabridged books, and watch 12 films. They will also take tests and quizzes, and write 2-page response papers about each work studied. Students will come away with this course with a grounding in Asian literature, and an understanding of its history and development; they will also be able to put the works in historical and cultural context. At the end of the trimester, the students will embark upon a 3-week cultural, political, and historical tour of Japan or another Asian country. Merit's Non-Fiction in Literature course offers an in-depth examination of non-fiction in literature. It is targeted towards advanced literature students who already have a firm grasp of literary analysis and criticism. Students will read 12 unabridged works from authors such as Stephen Hawkings, William Beebe, James Herriot, Henry Adams, Milton Friedman, and John Galbraith. They will also write 2-page response papers about each work studied. In addition to traditional discussions, readings, and writings, the students will also watch full-length classic films to offer a well-balanced perspective on non-fiction in literature. The students will also give two speeches and participate in one debate to further their analytical skills using themes covered in the reading selections. Merit Academy's Women in Literature course will critically examine the cultural endeavors and legacies of women writing in the English language, addressing both the similarities between the women writers/characters and the differences due to ethnic, socio-economic, age and national differences. It is an examination and exploration of women as subjects in and authors of literature, with an emphasis on 19th and 20th century works. The students will read 12 unabridged novels written by a diverse range of voices. The students write 1-2 page critical analyses, watch 12 movies, give speeches, participate in debates, and recite quotations. It is aimed at advanced students who have a firm grasp of literary history and have developed their critical reading and analysis skills. Merit Academy's Civics in Literature course offers the students selections of classic and contemporary literature that explore the world of government and politics. The students are required to read one abridged book per week (12 per trimester) and to write a 1-2 page critical analysis for each. Weekly lectures will provide background information and historical context. In order to foster critical thinking and familiarize students with various social and ethical concepts, this course places heavy emphasis on guided reading and film viewing, discussions and critical writing assignments. Also included in weekly studies are discussions and memorization of important quotations, in-class readings with evaluative examination of works by George Washington, Thomas Jefferson, Abraham Lincoln, Martin Luther King, Jr., etc., and viewed documentaries. Students will personally prepare and present speeches, essays, and participate in political debates. Merit Academy's Inner Self in Literature course offers the students unabridged selections of classic and contemporary literature that explores the human psyche and the quest for self-discovery. Required class work includes discussions and debates, critical analyses, a midterm and a final exam. While lectures will provide students with necessary background information and context, the main focus of this class will be discussion and debate. By reading and discussing the assigned reading and relating their discoveries to the material covered in their Psychology class, students will also develop an interdisciplinary perspective on both the assigned literature and the world in general. They will also hopefully be able to turn their critical and analytical skills on their own lives, and probe their own psyches with the intellectual rigor they apply to their course material. They will also watch selected films that pertain to the theme of this class. Merit Academy's Interpersonal Relationships in Literature course offers the students unabridged selections of classic and contemporary literature that demonstrate a variety values and roles people play in relationships. Students evaluate and discuss the selections to gather deeper insights into their relationship with the outside world. Lectures cover the various viewpoints of personal interaction in several types of writing: epics, poetry, short stories, novels, and dramas, so the student is able to understand motivation and character. Discernment and discrimination are major goals for the student when dealing with others. In addition to reading weekly novels, the students will also read special selections in class. Memorization of quotations gives the students a bank of classic quotes that they will be able to draw upon to use in their future essays and dialogues. Individual speeches and class debates will hone research skills and prepare the students to defend and speak about their personal theories and values. Through the eyes of Shakespeare, Austen, Faulkner, Vergil, Aeschylus, O'Neill, Freud, and others, the students will be able to contemplate their essence and evaluate their motives and goals. Discussions about verbal and non-verbal communication and their effects on relationships with the teacher and peers will help students to probe deeply into their personal relationships with those around them. By watching 12 full-length movies, the seniors will be exposed to both classic and contemporary films that have themes that center around interpersonal relationships. This is a full-year geometry course designed for accelerated students with a background in algebra. It strikes a balance between theory and application, and integrates concepts of space geometry and plane geometry throughout. The course begins with an introduction to proofs, which is followed by lessons in deductive and deductive reasoning as well as indirect proofs. After this, topics covered include: congruent triangles, similar polygons, right triangles, circles, construction and loci, plane figures, areas and volumes of solids, coordinate geometry, and transformations. Students solve geometry and logic problems, and work through proofs in long form throughout the course. To ensure their thorough understanding and retention of geometry concepts, students also complete all exercises in every chapter of the textbook. Students will begin Algebra 2 during the last 5 weeks of the academic year. Algebra II is one of the most fundamental courses for a future science student, and is essential for the study of chemistry, physics, biology and higher mathematics. Topics covered are graphs; linear equations; functions; systems of linear equations; exponents and polynomials; rational expressions; roots and radicals; quadratic equations and inequalities; inverse, exponential, and logarithmic functions; conic sections; and sequences and series. In order to build understanding and retention of the concepts taught in class, students are required to do 40-60 problems per night. Working at their own pace, the students complete the entire book in 2 trimesters. One quiz and one chapter test is given at the end of each chapter; a comprehensive final exam is given on the last day of the trimester. In order to acclimatize them to standardized tests, the students will be given an SAT Math test on alternate weeks. They will also solve a logic problem every other week. Although the teacher will discuss the solutions with the students in class at the end of the week, those who solve the problems before hand will receive extra credit points. The trigonometry course will cover trigonometric functions, acute angles and right triangles, radian measure and the circular functions, graphs of circular functions, trigonometric identities, inverse trigonometric functions and trigonometric equations, application of trigonometry and vectors, complex numbers, polar equations, parametric equations, and exponential and logarithmic functions. It is a prerequisite to Precalculus. In order to develop problem-solving skills, the students will also solve one logic problem every other week. Although the teacher will discuss the solutions with the students in class at the end of the week, those who solve the problems before hand will receive extra credit points. This one-trimester Pre-Calculus course will prepare students to take Merit's Math 1210H-1260H (Calculus). To ensure that students receive maximum exposure to and understanding of the relevant mathematical concepts, they will complete assigned homework exercises in each section of the textbook (and additional problems if necessary for comprehension). This pre-calculus course covers coordinates, graphs, and inequalities; functions; polynomials and rational functions/applications to iteration and optimization; exponential and logarithmic functions; trigonometric functions of angles; trigonometric functions of real numbers; analytic trigonometry; additional topics in trigonometry; systems of equations; analytic geometry; roots of polynomial equations; and additional topics. Accelerated students may test out of Precalculus and take this three trimester Calculus course. Students who choose to take the Precalculus course will need to finish the third trimester of Calculus during summer session. Merit's three-trimester calculus course will prepare students to take university physics series and advanced mathematics courses at the university level. It covers functions and models, limits and derivatives, differentiation rules, applications of differentiation, integrals, application of integration, and techniques of integration. To ensure that students thoroughly understand and retain the relevant mathematical concepts, they will complete all homework exercises in each section of the textbook. In order to give the students a good foundation in problem solving, they will work on one logic problem every other week. Merit's 2-Year (six-trimester) calculus course will prepare students to take university physics series and advanced mathematics courses at the university level. It covers applications of integration; differential equations, parametric equations and polar coordinates, infinite sequences and series, vectors and geometry of space, vector functions, partial derivatives, multiple integrals, vector calculus, 2nd order differential equations. To ensure that students thoroughly understand and retain the relevant mathematical concepts, they will complete all homework exercises in each section of the textbook. In order to give the students a good foundation in problem solving, they will work on one logic problem every other week. This accelerated Chemistry class serves as an introduction to chemistry and a prerequisite to other science courses. It covers chemical foundations: atoms, molecules and ions; Dalton's atomic theory, Boyle's chemical element, Charles's Law and the Bohr model; chemical equations; electricity; stoichiometry; Ideal Gas Law; Hess's Law; Plank's Postulate; Louis de Broglie's hypothesis; Heisenberg's uncertainty principle; wave functions; galvanic cells; La Ch'telier's principle; diffusion versus effusion; and heat. The goal of this class is to give the students the opportunity to enjoy chemistry while learning complex concepts that will prepare them for a future in the sciences. Chemistry labs will take place in the classroom or at a local laboratory, which will be arranged by the teacher. The students will conduct labs biweekly. The students will write at least one formal laboratory report per trimester as well as regular lab reports for each experiment conducted. The students will also take field trips to chemistry and energy labs to learn about a career in chemistry. Merit Academy's Introduction to Biology course serves as an introduction and a prerequisite to other science courses. It covers chemical foundations of life; molecular biology; cell physiology; genetics; morphology; physiology; development; evolution; natural selection; genetic variation; adaptation; speciation; ecosystems; behavioral, community, and population ecology. The goal of this class is to give the students the opportunity to enjoy biology while learning complex concepts that will prepare them for a future in the sciences. Homework assignments will be posted every week; homework will be collected and graded at every class meeting. Each trimester includes two midterm exams and one final exam. Biology labs will take place in the classroom or at a local laboratory, which will be arranged by the teacher. The students will also take various field trips to reinforce concepts learned in class and to learn about careers in biology. This class serves as an introduction to physics and a prerequisite to other physical science courses. It covers all areas of classical physics: Newton's Laws of Motion, straight line motion, circular motion, work and energy, potential and kinetic energy, conservation of energy, momentum, fluid mechanics, Bernoulli's equation, Doppler effect, mechanical waves, sound waves, electromagnetic waves, Huygens' Principle, microscope, telescope, constructive and destructive interference of light, Michelson interferometer, thermodynamics, Carnot cycle, electromagnetism, Coulomb's Law, Gauss's Law, Faraday's Law, Ampere's Law, Lenz's Law, Maxwell's equations, Kirchhoff's Rules and electrical circuits. The goal of this class is to provide the students with the opportunity to enjoy physics while learning complex physics concepts that will prepare them for a future in the sciences. Physics labs will take place in the classroom, at a local physics laboratory or on a computer. The students will conduct many labs to reinforce their learning process. The students will also take field trips to physics and energy labs to learn about a career in physics. Merit Academy's Introduction to Spanish Honors for 9th grade is an accelerated course designed to review grammar at a quick pace and emphasize complex grammatical structures. Instruction of the material is given in Spanish, and students are required to speak in Spanish during each class. Listening, reading, speaking, and writing skills are built through reading newspapers, short stories, poetry, listening to music, and learning idioms. Although this is a 9th grade Spanish class, the prerequisite to this class is Merit Academy's SPA 830H, an introductory Spanish class. It is assumed that the students have had two years of introductory Spanish to build vocabulary and present and past tense verb conjugations before entering this course. In order to become fluent in Spanish at the end of this 4-year program, the students will focus on Spanish grammar: adjectives, adverbs, conjunctions, interjections, nouns, prepositions, pronouns, and verbs. A special emphasis will be placed on conjugating verbs in the past, present, and future tenses. The students will also begin to examine the structure and use of the subjunctive. Merit Academy's Spanish course for 10th graders is accelerated and designed to improve oral and written Spanish skills by building a stronger foundation of grammar, syntax, and vocabulary. Instruction of the material is given in Spanish; students are expected to engage in Spanish conversation during each class. Reading, writing, speaking, and listening skills are practiced through novels, poetry, film, music, and translations of newspaper articles. To further solidify the students' Spanish grammar foundation, an emphasis will be placed on the subjunctive and complex, compound verbs in the present, past, and future tenses. By year's end, students will be expected understand Spanish grammar, translate reading material (from Spanish to English and vice versa), read literature and newspapers, write detailed essays on a variety of topics, and engage in extended discussions of Spanish literature, history, culture, and current events. They will also continue their immersion into Spanish history and culture by exposure to books, newspapers, films, music, and television. The students will travel to Costa Rica for 11 days at the end of the school year to be immersed into the language and culture of this Central American country. Merit Academy's Introduction to Spanish Honors for 11th graders is accelerated and designed to improve students' oral, written, and comprehension skills in Spanish. Classroom instruction and discussions will take place solely in Spanish. Grammar lectures and exercises, combined with further study of the subjunctive and complex/compound verbs in the present, past, subjunctive, and future tenses, will provide students with a solid foundation and reinforce lessons already learned. Weekly writing assignments about aspects of Latin American politics and culture and critiques of Spanish literary works are required. Students will be assigned a wide selection of Spanish literature and poetry, and will further improve their reading and comprehension skills by reading newspapers, watching Spanish news on television, listening to Spanish music, and seeing Spanish films. Field trips to Spanish films, restaurants, dances, and food markets will provide further exposure to Spanish language and culture. Students will continue their study of advanced Spanish grammar and vocabulary and review any problem points; they will also continue their immersion into Spanish history and culture by exposure to books, newspapers, films, music, and television. By year's end, students will be expected to master advanced Spanish grammar, translate reading material (from Spanish to English and vice versa), read literature and newspapers, produce analytical and critical papers on a variety of topics, and engage in extended critical discussions of Spanish works, history, culture, and current events. Cultural lectures with works from Marquez, Gamez, Borges, Laguna, etc. will be studied. The students will travel to Spain for 11 days to experience the Spanish culture, speak the language with the natives, experience the European difference in language accents and grammar. Merit Academy's 4th year Spanish course prepares students to take upper division Spanish courses at the college level. Heavy emphasis will be placed on learning useful, idiomatic Spanish vocabulary and in both producing and comprehending fluent, conversational Spanish. The instructor will provide time outside of class for individual review of any problem points for students, and class time will be dedicated to discussion. It increases proficiency using authentic materials from all media ranging from reading selections to video. Materials focus on topics such as social class, ethnicity, education, religion, economic and political developments and issues pertaining to the Spanish-speaking world with an emphasis on Latin America. Each student will share bi-weekly, a brief report of a Spanish article that has been read in a current newspaper or magazine. Students will be evaluated on the basis of written essays; regular participation in class activities and discussions; quizzes covering vocabulary and material from readings, tapes, films, etc. ; presentation of an oral report; bi-weekly presentation of a film review or article from a Spanish news program or magazine; two interviews with the teacher (one as a midterm, the other as a final). There will also be a telephone interview (the most difficult form of communication in a foreign language). In addition, students will prepare a brief tape discussing some theme from the class. The teacher will provide detailed evaluation of each tape, giving the student specific pointers to improve his/her oral skills. During the spring trimester, the students will dedicate 4 weeks for the preparation of the AP Spanish exam. The following 8 weeks will include Spanish movie and documentaries about historical and literary figures. The students will end their 4-year Spanish studies with a trip to Argentina. This Introduction to Latin course is designed to lay the foundations for the further study of Latin. 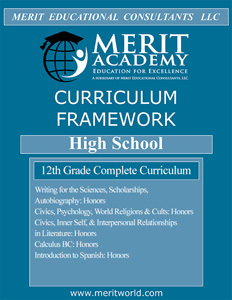 To this purpose, Merit uses the Cambridge Latin Course series of textbooks. The first two units of these textbooks introduce students to a broad range of grammatical concepts and vocabulary. While much of this is done with more traditional methods such as quizzes and written homework exercises, narrative and dramatic passages form the core of the course. They are the main means of consolidating the language, and increase in length and complexity as the course progresses. The passages have a developing story line and context related to a featured aspect of Roman culture. Readings on these cultural topics are assigned at the end of each stage and reviewed in class. Grammatically, the course introduces students to the nominative, genitive, dative, accusative, and ablative cases as well as several verb tense tenses - some of which we do not have in English. This accelerated 10th grade Latin course is a continuation of LAT 910H-930H. It is designed to improve upon and cement the foundations of Latin learned the previous year. Merit uses the Cambridge Latin Course series of textbooks to introduce students to a broad range of grammatical concepts and vocabulary. While much of this is done with more traditional methods such as quizzes and written homework exercises, narrative and dramatic passages form the core of this course. They are the main means of consolidating the language, and increase in length and complexity as the course progresses. The passages have a developing story line and context related to a featured aspect of Roman culture. Readings on these cultural topics are assigned at the end of each stage and reviewed in class. The course expands upon the usage of cases and verb tenses learned the year prior, in addition to introducing several new concepts such as the subjunctive mood and the passive voice. This year-long course is designed to solidify the Latin that students have learned over the past three years. It not only prepares them for upper division university Latin courses, but awards them university credit with the passage of the AP Latin: Vergil Test. The course is designed to challenge the student and encourage the development of independent study habits. The reading for the course is from one of the most widely read and admired texts in the Western canon: Vergil's epic poem Aeneid. To prepare students for the rich, complex language of Vergil, there will be lectures and quizzes on a variety of figures of speech. Words that are found 24 times or more in the Aeneid, the 'General Word List', are an essential key to reading this text smoothly and quizzes are given weekly to ensure that students are up-to-date on the matter. Much of the work done in class consists of translating passages of Vergil and students are required to prepare between 50 and 80 Lines of Latin each week. In addition to analyzing selections of the original text, students will be required to read the entire Aeneid in English translation as well. For a comprehensive description of all 6 courses, please visit each individual course. For a comprehensive description of all 7 courses, please visit each individual course. For a comprehensive description of all 5 courses, please visit each individual course.